Over at Seattle Weekly, Jon Kauffman gives some deeply-researched juice to Seattle’s yoshoku scene in a dual review of the Cutting Board and Fort St. George. “Both serve yoshoku cuisine, a style of Japanese food in which nostalgia, outsiders’ fantasies, and sometimes even good taste come into conflict,” Kauffman explains, adding “Yoshoku dishes are Japanese interpretations of Western ones,” and that the cuisine — known for such dishes as kare raisu (say it slowly while affecting a Japanese accent and you won’t need a translator) — dates back more than a century. And, go figure. 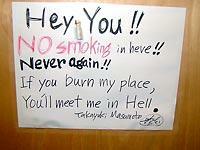 Both of those stories come to play at a little Japanese restaurant in Mukilteo, Cafe Soleil. Not to be confused with the charming little Ethiopian cafe in Madrona, and other same-name restaurants nationwide. That lawsuit, one can only pray, will not be forthcoming. This week I heard from Cafe Soleil’s Junji Ichikawa, whom I was introduced to several years ago while sitting at the sushi bar at late Yamashiro Sushi Bistro in Shoreline. Yes, that Yamashiro. The one owned by Tony Kang, the man behind Yamashiro LLC and owner of Chao Bistro-Bar — the latest in a string of restaurants to take over the old 1200 Bistro on Capitol Hill. Junji was “the talented young sushi chef” I talked about in my glowing review of Yamashiro. It’s been a few years since I ran into him when he was dining with friends at Shun, the Japanese restaurant near U-Village (set to re-open any day now in its new location in one of those mixed-use complexes on 25th Ave. NE). At the time, Junji mentioned he was hoping to open a place of his own. Which is exactly what he did two months ago. “I have been waiting for this moment since I started working in the restaurant industry,” he said of his 20-seat cafe, co-owned with Shinchi Nakagawa — late of Bellevue’s Ginza. Shinchi studied French cooking in Japan and acts as Cafe Soleil’s executive chef, said Junji, whose career encompasses stints at I Love Sushi, Nishino and Wasabi Bistro. And what are they serving in Mukilteo? Well, due to popular demand, they’ve just added some sushi rolls, but their focus is yoshoku, said Junji: “homemade curry, hayashi rice, hamburger steak and so on” (viewed in living color here). He’s excited, too, about working in their open kitchen, where the chefs can commune with their customers. And blow me over: when I clicked on Cafe Soleil’s website to check the place out, it dawned on me: Mukilteo’s new yoshoku restaurant is inhabiting the old Grouchy Chef location! 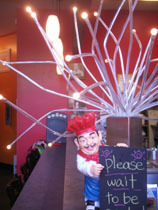 At left, a special “No!”-tice, one of many posted at the Grouchy Chef (courtesy of Grouchy’s fan David Wahl). At right, a not-so-grouchy chef’s sign, courtesy of Cafe Soleil. As for Grouchy — who may be cranky, but he sure can cook — Junji (and Grouchy’s fans on Chowhound) say he has plans to open another restaurant on Russell Road, a few blocks south of Cafe Soleil. Grouchy? You out there? What’s the word on that?